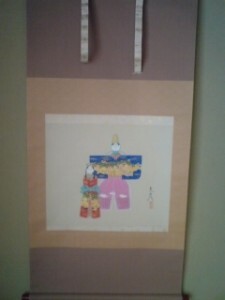 If you are interested in Japanese culture, February is a good time to be invited into Japanese homes. Hotel lobbies, community centers and department stores can also be interesting at the same time of year. This is because, traditionally, from early to mid-February through March 3rd, Japanese people take their HINA DOLLS, in all their variety, out of storage, and put them on display. These past few weeks I have seen and photographed a wide spectrum of these popular festive decorations, from enormous and elaborate ( and extremely expensive!) 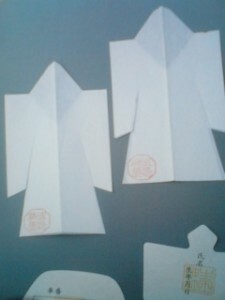 multi-level sets, to tiny, hand-made origami ( folded paper) dolls. 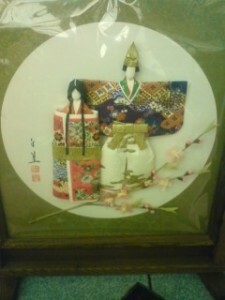 Many families have put out more than one set, and then, other Hina Doll decorations, for example hanging scrolls or paintings, as well. 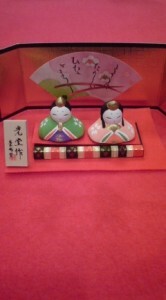 In order to simply explain what this custom is all about, Japanese friends will tell you that these dolls are meant to celebrate daughters- and represent a prayer for their healthy growth and a happy marriage in the future. They will also probably tell you that these dolls should be PUT AWAY right after the Hina Festival, which is on March 3rd. The reason for this is that there has long been the belief that if a family does not put the dolls away promptly, their daughters will not be able to find a husband. The fact is, however, that now, customs are changing. 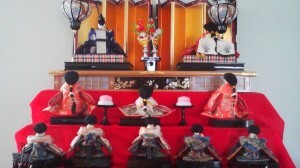 Even families without daughters might display dolls. 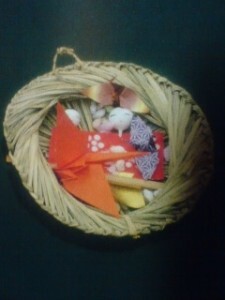 In families with only sons ( or no children at all ), these are often the mother`s own Hina Dolls brought from her parents home. Then there are those without family who simply like to decorate their apartments with Hina Doll motifs just to get into the spirit of the season. 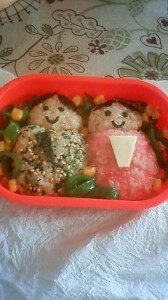 There are also many families with daughters these days who do NOT follow the custom of promptly putting the dolls away. Either they are too busy to do so, or they just like to keep them out on display. Anyway, they are not worried about the old superstition. Thus, you might find dolls still on display at people homes throughout march. What Japanese friends will probably not tell you ( because they might not know ! ), is about the amazing evolution of this beautiful custom and about how dolls, or figurines have been so important in Japan for millenia as SCAPEGOATS used for taking on the impurities and bad energies of humans. First lets look at why there is a festival held on March 3rd. 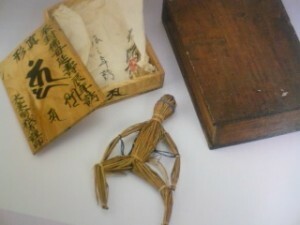 In ancient China, the first DAY OF THE SNAKE of the 3rd month ( in the Chinese calendar there is a 12 day cycle with each day representing an animal of the zodiac) was a day for ritual purification known in Japanese as JOSHI NO SEKKU 上巳の節句　（which is still an alternate name for the Hina Doll festival in Japan). These symbolic ablutions were performed by a pond or a river, with water and rice wine being used to cleanse the mouth hands and feet. It became customary on this day ( 3/3) for Chinese aristocrats to hold poetry parties by artificial streams. A bowl would be floated down the stream with a cup of wine . Participants sitting at various points downstream, would have to compose and recite a poem before the bowl reached them. This was an elegant and cultured festival game, played under the peach blossoms which bloomed in April( the month on the Gregorian Calendar which usually corresponds to the 3rd Chinese month). 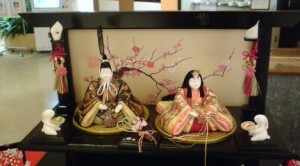 This is significant because the Japanese Doll Festival is still strongly associated with PEACH BLOSSOMS ( another alternate name for the festival in Japan is the Peach Festival and little peach trees are part of the full doll sets). Strangely, however, since 1873, when the Japanese changed their calendar, the Peach Festival has been celebrated in March ( the new 3rd month), making it fall about one month before the arrival of the actual peach blossoms. These Chinese customs were adopted by the aristocracts and noblity of Japan , probably in the Nara Period ( 710-794), when everything Chinese was the rage, and certainly by sometime in the Heian Period ( 794-1185). 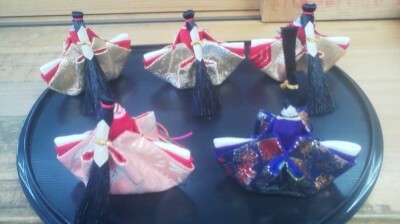 Thus, each of the seasonal change days ( SEKKU) was recognized and celebrated by the Japanese court. However, as with so much else which came from China, customs evolved and blended with native Japanese traditions. In Japan, the ritual cleansings for the 3rd day of the 3rd month were performed in a typical and very ancient Japanese way- by rubbing the body with human shaped figurines made of paper, straw, clay or wood. These were called KATASHIRO or HITOGATA, and were believed to have the power to absorb all spiritual impurites and bad energies. 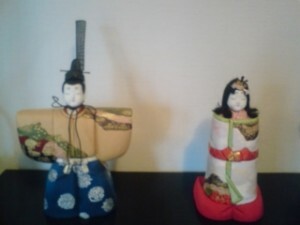 The Japanese have used figurines in this way for thousands of years. 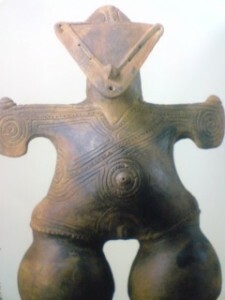 The clay figurines called DOGU, commonly found at JOMON period ( 10,000 BC-300 BC) archaeological sites, are believed to have been used for similar ritual purposes, as surrogates to take on sickness or bad luck before being smashed, to rid the individual or community of these evils. 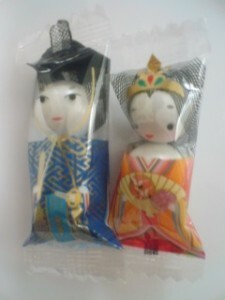 For the purification on the 3rd day of the 3rd month ( the Peach Festival) , however, under the influence of the Chinese poetry recitings by the stream, the KATASHIRO figures were cast off onto rivers or ponds, sending away impurites and bad luck. From the literature of the Heian Perod, we also know that there were dolls for play ( not for ritual use), which were called HIINA ( at that time meaning little things), and were a male- female pair. It is possible that these were based on, or derived from the HITOGATA used for ritual purposes. It is the name of these play dolls, in shortened form HINA, which came to be used for the Peach Festival dolls. 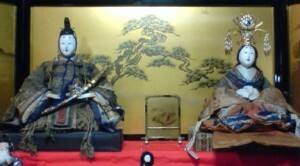 ( and thus we can see a blending of the two streams- the ritual dolls and the play dolls). (It is very important to keep in mind that at this early stage, the Peach Festival, the day for ritual cleansings with the HITOGATA was NOT yet thought of as GIRLS DAY, and the ceremony was carried out for both sexes. No one is exactly sure when, but probably in the Edo Period, the seasonal change day on the 3rd day of the third month became associated with girls, while that of the 5th day of the fifth month became so for boys. The rationalization for doing this can be seen in GORO AWASE ( association by similarity in shape or sound) which is so important in Japanese culture. 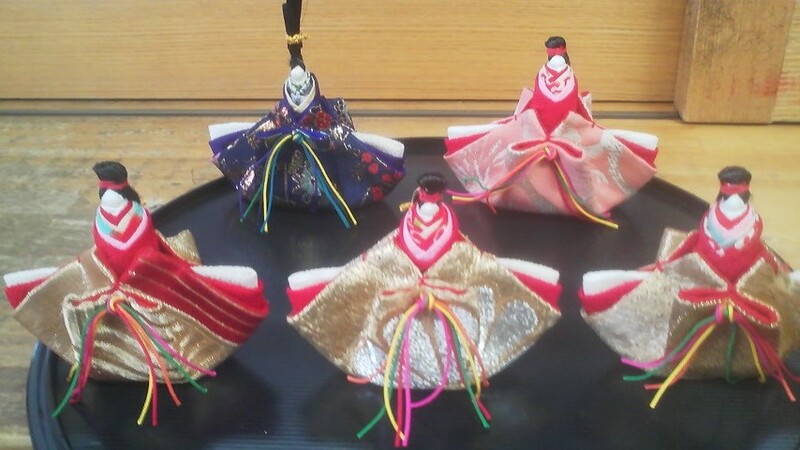 The ritual dolls themselves then came to be more decorative, dressed in kimono etc., and children would sleep with them the night before they were cast off ( letting impurities be drawn out overnight!). By the Muromachi Period ( 1336-1573) beautiful Hina Dolls were being made for the aristocracy using new techniques imported from China. 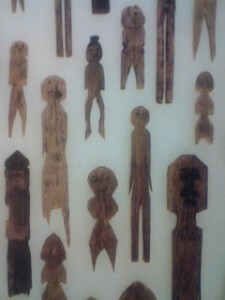 They were posed in a standing position ( Tachi-Bina). It was only later, in the Edo Period ( 1600-1868), that Japan`s craftmen created the elaborate Hina Dolls, which we know today, for a growing merchant class which could afford them, as well as for the warrior class and the aristocracy. 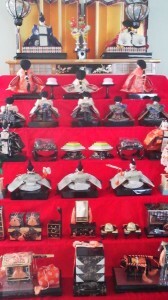 There were special doll markets held in Edo, at tfor restraint and modesty during the festival. 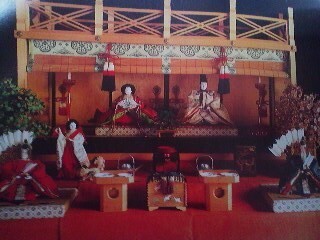 Still throughut the Edo Peiod Hina Dolls were mostly sold and displayed in Edo (Tokyo), and other major cultual and commercial centers. It was not until the Meiji Period ( beginning in 1868) that the custom of displaying Hina Dolls became universal throughout Japan. 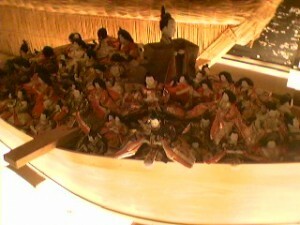 Even with the creation of the elaborate sets, which represented an Imperial wedding procession, the Japanese believed that each years impurities were absorbed by the dolls. Interestingly, the custom of putting away the dolls right after the festival, is probably a replacement for the casting dolls off into the rivers. Naturally, the expensive sets could not be thrown away each year. 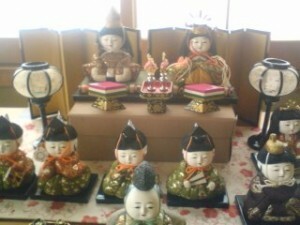 Through the 3rd of March you will be able to have a look at the various types of Hina Dolls at several locations near Tsukuba- most famously in Makabe ( Sakuragawa City) which holds what is something like a town-wide open house for doll viewing.Some of the dolls are more than 150 years old. 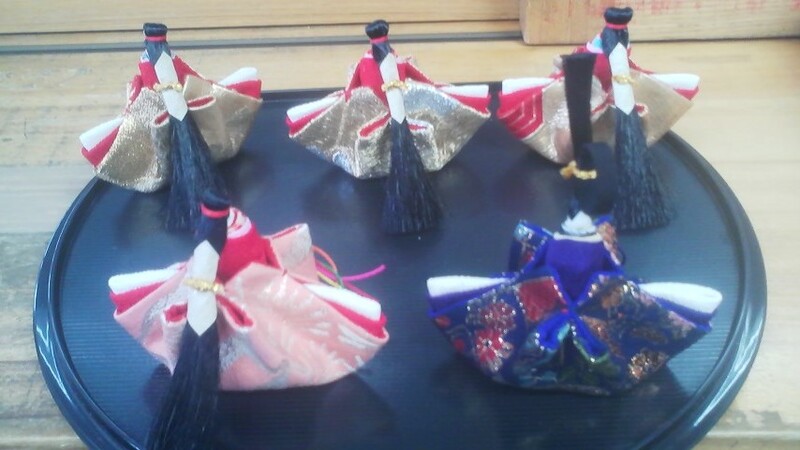 Celebrating HINA MATSURI ( The Doll Festival) – some Tsukubans will be taking their time in putting away their HINA DOLLS! Sorry, I couldn’t help laughing when I saw the dolls’ backs turned. It’s like they turned their backs on me. Is that obento yours?